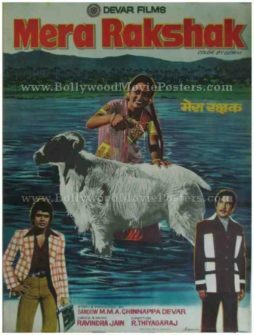 Old Bollywood film poster for sale of the classic Hindi movie Mera Rakshak (1978). This is an actual surviving old Bollywood poster for sale of the 1978 Hindi film that starred Mithun Chakraborty and Rameshwari in lead roles. Printed and circulated during the original first release of the film (somewhere in the late 1970s), this Mithun Chakraborty movie poster was designed for publicity of the film but never ended up being used. This Mithun movie poster was originally designed on a canvas board using a collage of still photographs pasted against a hand painted background. Mera Rakshak was an offbeat film that featured a ram that plays the bodyguard of the lead actress Rameshwari! The ram, essential to the film’s plot, is seen featured in a large photographic still at the center. Actress Rameshwari is seen bathing the ram in a blue lake. Actor Mithun Chakraborty is seen in a smaller photographic still at the bottom. 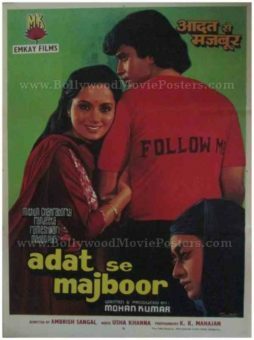 This old Bollywood poster for sale is set against a picturesque background, with the typography appearing in red.